Red Dead Online’s beta launched this week, and it’s a looser, sillier experience than the main game. 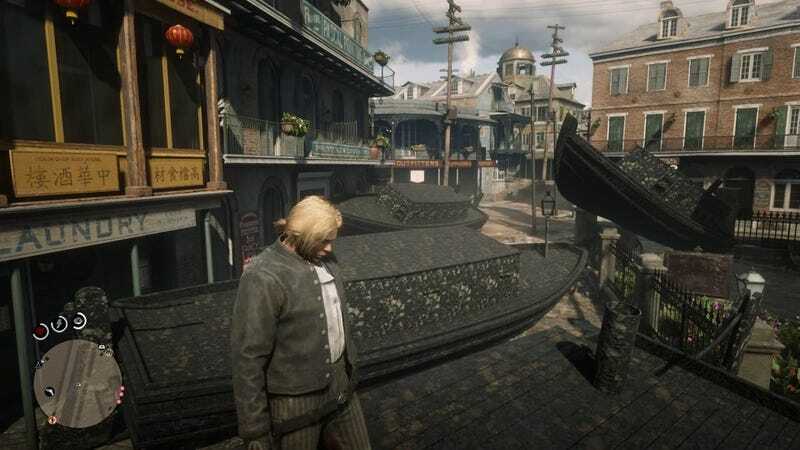 But a beta mean glitches, and there’s been nothing stranger than the cavalcade of burnt-out boats mysteriously plaguing the city of Saint Denis. Players romping around Red Dead Online are taking to social media and YouTube to share a glitchy situation straight out of a nautical-themed creepypasta. Numerous players report that they’ve encounters dozens of displaced, grimy boats cluttering Saint Denis’ streets. Players are reporting that the boats are falling from the sky or spawning in the wrong location, The result is a strange field of boat corpses. When enough appear, they cause framerates to plummet. It’s left players wondering if there’s a more malicious cause than a mere glitch. Regardless of the cause, the boats are piling up in Saint Denis. In some cases, invisible boats and other unknown pieces of geometry are spawning as well. Travelers to Lemoyne’s civilized metropolis are advised to exercise caution while riding their horses lest they smash into an invisible boat and kill their horse. They should also be careful of approaching the boats, as they may smash about in strange directions.